This is a great snack or meal idea for when you have leftovers. In this case, I had keema or ground meat cooked in delicious spices. We had a great meal with fresh rotis and some lentils. It was one of those crazy busy days and I didn’t have a lot of time to prepare a meal. I did have the leftover keema but not enough for another meal. I decided to use it for another quick meal. Quesadillas and pizzas come to mind when I think of using up leftovers. I had a carton of tomatoes which I roasted simply with olive oil and salt. I put the tomatoes through a food mill (or a processor) and made a quick sauce. I used the sauce as the first layer on a whole wheat tortillas. I then topped it with the keema, cheese and some pickled jalapenos. I topped the ensemble with another tortilla and cooked it till the quesadilla was crisp on the outside and gooey on the inside. Migas Tacos- An Austin, TX Favorite.. I made these tacos for the New York Times, Local a few weeks ago. It was right after my daughter and I returned from our trip to Austin. We go there almost every year to visit family and really enjoy the Mexican food- it tastes a lot more authentic and it is available almost everywhere. I made this yummy, creamy sauce to complement the tacos. It was delicious on top of warm, savory tacos. Overall, the meal was a big success. I made some vegetarian refried beans and roasted potatoes on the side. I made them for dinner and everyone loved them- including my daughter. For her, I skipped the jalapenos and tomatoes. She had some of the beans but doesn’t like potatoes. Try these tacos for a brunch or dinner – you will love them. I loved making these enchiladas- what a great way to use up my leftovers. I feel like a champion when I come up with a completely different preparation to use up stuff in the fridge. I had the Mexican pork chili in the fridge and wasn’t in the mood to cook a whole new meal. I always have all kinds of tortillas and cheeses in the fridge. So, I immediately thought of enchiladas. I had enough to make 3 to 4 enchiladas which was perfect for my husband and I. A big salad with the enchiladas was perfect for a healthy, delicious dinner. I separated the meat from the sauce and then shredded the pork with my fingers. I then placed the sauce in a flat platter so I can dip the tortillas in there to make them soft and pliable. I stuffed the tortillas, placed them in a shallow platter and then topped the whole thing with a mixture of Mexican cheeses- how easy was that! This method can be used for any kind of leftover. Even if your leftover has no sauce, you can use a jar of your favorite salsa or tomato sauce and bake your enchiladas to perfection. This is a great way to transform your left overs and create a wonderful, quick lunch. I made this for myself with the leftover mushroom mixture from the enchilada dinner. Smoked salmon is always in my fridge. I try to eat it as much as possible especially since the other two people in my family don’t care for the fish at all. I wanted to make a substantial yet healthy lunch for myself. I took out the mushroom filling and the salmon. I decided to add some spicy low fat cheese- just a few, very thin slices to add some creaminess to the dish. I also always have whole-wheat tortillas in the fridge- and that was it- a quesadilla was born. I added the mushroom filling, salmon, cheese and baby spinach- also, always in my fridge. It was a well-balanced, quick and delicious lunch. Best of all, I ate it with some delicious homemade salsa. This is a quick, healthy side dish I came up with while I was cooking the rest of the meal for my friends. I had the enchiladas and rice. I was serving homemade salsa and guacamole with chips before dinner but something was still bothering me. I felt I didn’t have a balanced meal as yet. That is when beans came to mind. As I started looking for recipe ideas for the refried beans, I realized most recipes called for frying the beans in pork fat or bacon. Normally I would add pancetta or bacon to the mix because as far as I am concerned, everything is better with bacon- but in this case I needed to make the dish vegetarian. I started by cooking canned pinto beans in water and mashing them but left still them a bit chunky. As I was sauteing them with the onions and garlic, I kept thinking of a flavoring that would mimic the smokey flavor of bacon. Smoked paprika came to mind. That’s it- I thought. It was delicious paired with the creamy pinto beans, the onions and the garlic. In fact I would make this dish the same way again- why add extra calories with the bacon when I can achieve a similar flavor with the paprika? I topped the dish with cilantro and queso fresco and the meal was well balanced, healthy and delicious! Try these refried beans and you will never use the canned ones again! I made this rice with the Mexican/Latin entree I was making for a small get together. I had initially thought of making Spanish rice with tomatoes, onions and garlic and lots of lime juice but when I thought of my main entree, I realized the enchiladas were cooked in a red sauce- and I didn’t want to make red rice with it. It would be drab looking. After doing some thinking- I came up with this green rice. One of the things I think of when coming up with a menu is presentation. I strive to have a colorful mix when serving any meal. We eat with our eyes first and it is very healthy to have foods of all different colors. In this case, I had baby spinach in the fridge- it is one of the staple vegetables you will always find at my house. I blended spinach, cilantro, green onions and garlic together and used the paste as the base for rice. It was delicious and paired really well with the enchiladas. This side dish is very versatile- serve it with chicken, fish or a steak. Pair it with a quesadilla or serve with some eggs and refried beans for breakfast. Speaking of refried beans- wait till you see how easy they are to make- recipe will be up tomorrow! This is a fabulous meal to make for company or if you just want to impress your family. It is a vegetarian meal but you can substitute any kind of meat in here including chicken, pork, shrimp or even fish. I made this fabulous meal for a friend who was coming over with her family. They are vegetarian so I had to be careful and use vegetable broth where ever I normally use chicken broth, etc. I made a delicious stuffing for the enchiladas with cremini mushrooms, onions and garlic. I added paprika and unsweetened cocoa. I wanted to emulate the mole sauce flavor which is a very labor intensive dish to make requiring lots of ingredients. I decided to introduce just the cocoa part to the stuffing to bring out the earthiness in the mushrooms. 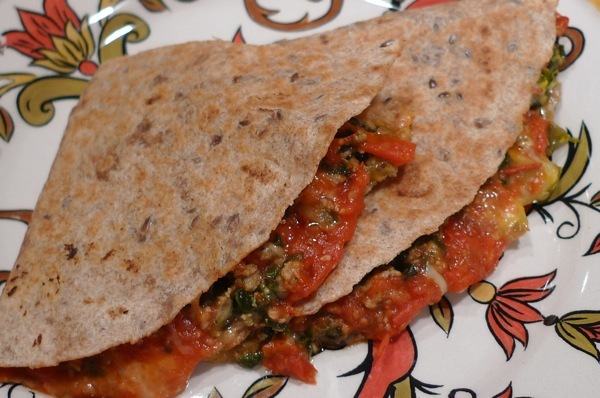 I used whole-wheat tortillas- and guess what- no one noticed. Once the tortillas are doused with the super flavorful sauce, you can’t tell the difference. A perfect, sneaky way to make the dish healthy without anyone knowing. I also cooked up some green rice and some quick vegetarian refried beans- recipes to follow tomorrow and the day after. Definitely try making the mushroom enchiladas with new mexico red chilies- you will be impressed with yourself.